Home » ★★★☆☆ » Balthazar. A feast. Balthazar. According to Wikipedia, it’s either a name commonly attributed to one of the Biblical Magi, an alternative form of the name of the Babylonian King Belshazzar (that story doesn’t have a happy ending) or a 12-litre champagne or wine bottle. Whilst the story of King Balthazar centres around a feast, I suspect it’s the wine bottle that we’re going for here and this is the sort of place in which you could see yourself ordering such a bottle. If they have one. Which I haven’t checked. Yet. I had not expected to get a table, but it was a Monday night and I thought I’d take my chances. I was going with an old client, who rarely fails to remind me that I am older than him. Even if it is only by a matter of days. This is mere hair-splitting. We are both the wrong side of middle-aged. Dinner was by way of a thank you for a new instruction to mark the re-kindling of our working relationship, after a long gap. It felt like a celebration, what with the greeting from the very enthusiastic staff and I was a little overwhelmed at the size of the place. It’s massive, buzzy, noisy and has atmosphere in spades. From a standing start, to this, in two months, is a major achievement, even with the overwhelming tsunami of hype that has accompanied it. And brave, to be in the foodie graveyard that is the Covent Garden Piazza. I mean, when was the last time you thought of going there to eat? I suspect that this will become the trailblazer for new openings in the vicinity and it will, again, be a place on your restaurant radar and not a place where you expect to get something mediocre, pre- theatre because there is just no choice. Other than Mishkin, which is not for me. And the menu is massive too, just like the restaurant, but there is nothing on it which is too challenging. Or challenging at all. And I usually run screaming from a big menu but not here. There are nods to modernity, such as ceviche, but really, this is a traditional French brasserie-by-way-of-New York menu. All the usual suspects are there, but there are a few things you might not expect. Like my delicious kale salad with cranberries, butternut squash and toasted almonds. A flourish of really fresh pepper from a mill which appeared to be clipped to the waiter’s buttocks, was a revelation. In fact, it almost made the dish. It wasn’t like other pepper you may have had. Or maybe that’s just me. And then for my main course, New York Strip, served on the bone. All the usual accompaniments were available; creamed spinach, onion rings, chips, mashed potato. You know the drill. It came served with watercress and mâitre d’ butter. Perfectly cooked and served with a mound of very fresh watercress this was a simple classic dish done perfectly. Old client ordered said ceviche, which came in a wrapped in radicchio and was a stonkingly generous portion. He then ordered stone bass en papillote, because, other than in relation to his bezzie mate, a glass of beer, he is a very healthy type. He goes to the gym and does marathons and everything. Actually, it was helpful that it was a little dark in there, because it meant that I couldn’t really see his tan, which came by way of Portugal and Kilimanjaro. The stories of the extreme hardships encountered on his charity challenge, (Kilimanjaro, not Portugal, in case you were wondering) put my gringes into perspective for oh, about five seconds. The fish was good and came on a bed of vegetables and the large cylinder of thinly-cut chips were demolished with ease. And they get double brownie points for having my favourite wine on the list – the Trimbach Ribeauville 2004 Gewürtztraminer. I made my other client taste it as soon as he walked through the door. I was disappointed that he didn’t love it immediately. We usually share the same wine taste. I’m going to work on it. He loves it, he just doesn’t know it yet. The client who was my actual guest said that this reminded him of Langans and I can see what he means. Like Langans, this has a massive menu. Like Langan’s it’s a big old behemoth of a restaurant. Like Langan’s of old, it serves unchallenging food but very, very well. Usually, a massive menu is a massive no-no for me, but here it feels right and it doesn’t feel like the kitchen is stretched. The food is simple, straightforward and veers towards all things comfort-food and the fact that I had narrowed my choices down to about only about ten possibles for the main course, tells you everything you need to know. And soon, I’ll be back for the chocolate soufflé. I could have, but I thought I might try a little delayed gratification. I’m still regretting it. 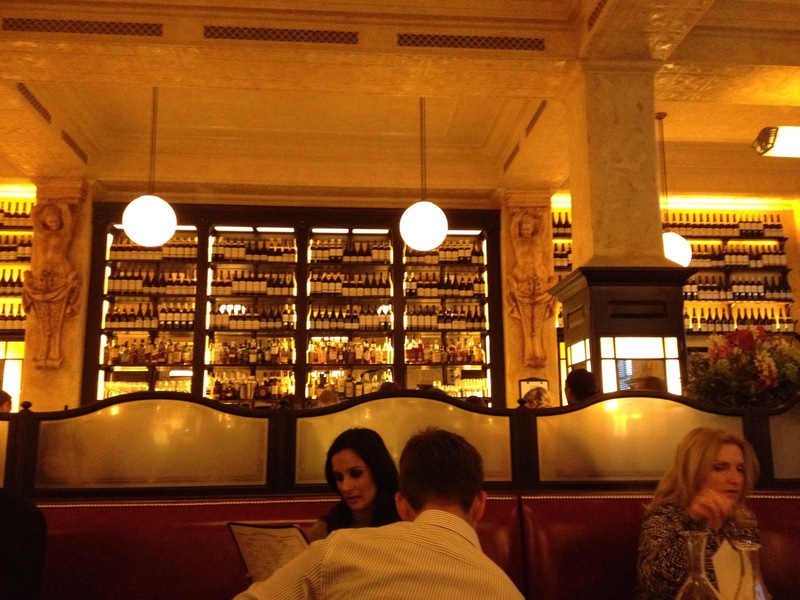 So get on your chariot and go have a feast at Balthazar. I think you’ll like it.